A guide on agile project management and how it helps you achieve great things at work. Only few terms in the field of project management have the power to trigger such controversial discussions among project management experts as agile project management. Some preach the virtues of agile, believing it is the project management method of the future while others harshly criticize the method and don't get tired to list examples of agile project failures. The agile project management methodology is one of the many tool kits available to project managers for project execution and team collaboration. Like any other tool, agile project management techniques have to be used the right way and for the right purpose in order to lead to successful project delivery. This handy guide serves as an introduction to the concept of agile project management and how you can use it to achieve great results in project execution and team collaboration. We have also consolidated information on the most frequently used techniques that the agile tool kit includes as well as some example cases that benefit from agile project management methods. The agile approach to project management is based on continuous iteration; this allows for more scope flexibility and helps businesses respond more quickly to unpredictability in project execution. Developed as an alternative to traditional project management methods, agile project management focuses on team and client input as well as interactive collaboration to achieve better project results. Firmly rooted in information technology and communication sector, agile project management methodologies increasingly find their way into a wide range of industries such as engineering, production and creative activities like new product and service development projects. In projects that use the agile approach, small-scale but functioning portions of the final deliverable are completed during every iteration. The intermediate product is reviewed and evaluated by the project team, which may include an assessment by client representatives. Team members and client test the current product against the project requirments, and the insights gained from the evaluation of the iteration determine the next steps that are taken in the project. The main benefit of this procedure is that necessary changes to the project plan can be made as early as possible - saving valuable resources and helping deliver projects on time and within budget. 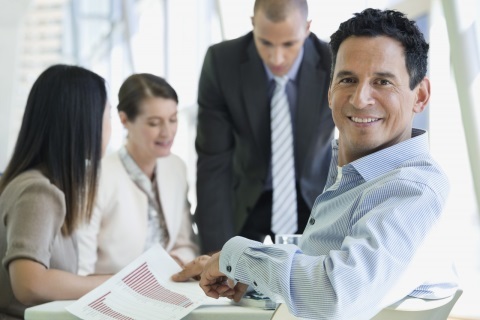 Most people on the project team have a hands-on role in creating the project deliverable. They are often referred to as developer, programmer, tester, designer, and writer. Team members collaboratively assign tasks to the individual resource and determine which technique is best in order to achieve the pre-stated project goals. The ideal team member is a generalizing specialist with expertise in several (technical) fields, allowing them to contribute value in multiple aspects of the product. In Scrum, this role is called “Scrum Master”, in other methods the team lead is called the “team coach” or “project lead”. The team lead’s main responsibility is to support the team in working in the most effective manner possible. He serves to the team by removing anything that impedes project progress and providing the team with the resources necessary for successful project delivery. This role includes all the soft skills in project management but not the technical aspects like planning and scheduling. The product owner, as implied by the role title, is an expert on the product and knows the details of the customer’s needs and priorities. This roles is sometimes called the customer representative and functions as an intermediary between the team and the customer. Working with the team on a daily basis, the product owner helps clarify requirements and prioritize project items. Additionally, he is responsible for making project decisions and providing all the necessary information to the respective project stakeholders in an effort to achieve high-quality deliverables. Everyone involved in the project is considered a stakeholder. The stakeholder group is the most diverse one, including people from different departments or even different companies in roles like product users, investors, product portfolio managers and support team members, to name only a few. Stakeholders are not directly responsible for the project results, but they provide input and are affected by the project outcome. One try is worth a million words. Get started with your full-featured 30-day trial now! Sign up for an individual live session with one of our consultants who will walk you through the software step-by-step. Read more about the InLoox product portfolio and find the product that best fits your needs. Find out what our customers like best about InLoox and what the expert media thinks. Agile Techniques: Kanban, Lean, Scrum & Co.
Agile project management approaches emphasize that the project team should work as a tightly integrated unit. Everyone on the project team is equally responsible for successful project delivery and customer satisfaction. Continuous delivery of high-quality results are paramount. Strong and informal communication ethics are the basis of this concept, making brief daily stand-up meetings a fundamental element of the agile project management process. Frequent communication helps determine the daily workload according to the latest project priorities and project item dependencies. In contrast to traditional approaches, agile project management methods feature short delivery cycles, on average ranging from one to four weeks. We compiled information on the most common agile project management methodologies, serving as an introductory guide to the world of agile project management. We also added common business cases in which agile project management techniques are used on a regular basis. Kanban is japanese for "signal card" and originally refers to a production technique developed by employers of the automotive manufacturer Toyota. In an effort to optimize Toyota's production system, Taiichi Ohno created a concept that focuses on inventory reduction and continuous production flow. In the context of agile project management, Kanban is a product creation and development method that focuses on continuous delivery of incremental products. This method is popular in the IT sector and often used for managing software development projects. Like other agile project management methods, Kanban project management is designed to help teams work together more effectively. David Anderson is considered the inventor of Kanban project management in the field of information technology and introduced his concept of agile project management in 2007. Even though he borrowed the name, Kanban in information technology does not copy the manufacturing techniques. The Kanban project management methodology is based on lean development principles and combines them with ideas from the Theory of Constraints and classic risk management. Start with what you do now - Kanban is a change method; it starts with your specific status quo and stimulates evolutionary changes to your system. Agree to continuous change - Everyone involved (team or organization) must agree to small incremental changes that improve the system. Respect the status quo - Not everything needs improvement, some elements of the system might already work very well. Don't be afraid to preserve them. Always keeping in mind principle #2. Leadership on all levels - Improvement can only take place if everyone contributes to the process. Encourage acts of leadership and feedback on all level - especially from those who are closest to the process. On top of the four principles, Anderson identified six core practices that he observed in companies that sucessfully implemented Kanban project management method. In order to facilitate more effective team work, it is helpful to see what everyone is currently working on. All the project related tasks and work packages are listed on the so called Kanban board that also reflects a tasks current status. On the way to completion, a Kanban or work package moves from left to right on the board. Capping the number of work packages that one team (member) can work on at the same time helps maintain a balanced workflow and avoids work overload. The team (member) pro-actively starts working on the next work package every time the previous task has been completed. This pull-system ensures that no one commits to too much work at once. 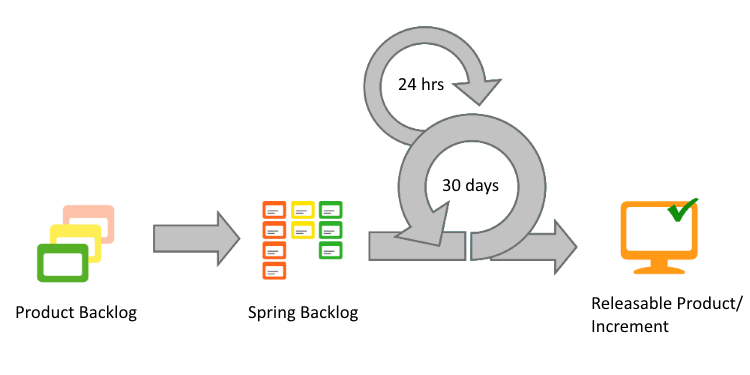 In order to improve the workflow it is necessary to measure key information like backlog, cycle time and output. Based on this work data, the team can provided stable information to the client and also optimize their work organization. Efficient teamwork demands that everyone involved has the same understanding of what the process requirements are. There should be a clear definition of what the status "complete" or "done" entails, when to start working on a new task and according to which prioritization rules. Most project related information that is crucial for successful project delivery as well as process improvement is with the project team. You can only improve a process if you listen to the feedback that those with hands on experience provide to you. Kanban project management focuses on small continuous and incremental evolution. The change process should be based on models because they make it easy to create a common understanding of current processes as well as determining experiments that can help achieve improvement. InLoox for Outlook supports multiple teams using multiple project management methods. You can combine different agile project management methods and use them alongside classic approaches - for optimal collaboration even across departments. 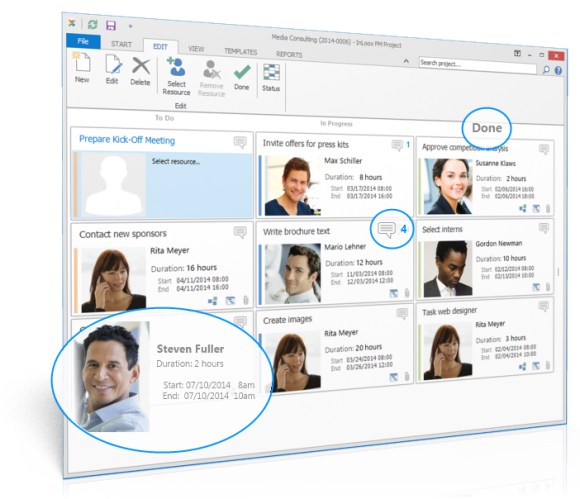 Teams working with Kanban benefit from InLoox for Outlook's customizable Kanban board and collaboration features. The InLoox for Outlook Kanban board provides an up-to-date overview of the backlog, work in progress and completed workload. Customize the status bar to adjust to your specific project needs. Additionally, the Kanban board becomes the central communication platform for everyone involved: leave work package related comments and attach relevant documents. have a look at InLoox for Outlook. At the core of lean project management are two elements: Eliminating waste and maximizing value for the client. “Waste” in the context of lean project management refers to any use of project related resources that do not directly contribute to achieving the defined project goals. In order to eliminate anything that isn’t adding value to the project, it is necessary to maintain a continuous flow of strong communication between all stakeholders. You actually don’t do lean but you use lean to improve your processes. Instead of focusing on each individual task’s deadline you rather focus on the dependencies between tasks and determine potential bottlenecks in your project plan. Once you know the tight spots in your timeline and/or resource capacities, you can go ahead and try to eliminate them. This also means eliminating inefficient ways of working that keep us from delivering faster – like multitasking. The Lean philosophy emphasizes the importance of the keeping an eye on the grand picture and the project’s final deliverable. All activities and work packages created as part of the project are assessed according to their contribution to the project value. The underlying principle here is information transparency. In order to ensure high transparency, it is very helpful to visualize the project plan and status. A project management software can help here because they include project timeline and scheduling features as well as visual task management features like Kanban boards. Scrum has its origins in sports and emphasizes the importance of teamwork for achieving goals. It is an agile method of project management and was developed in order to help teams collaborate more effectively towards a project's goal. 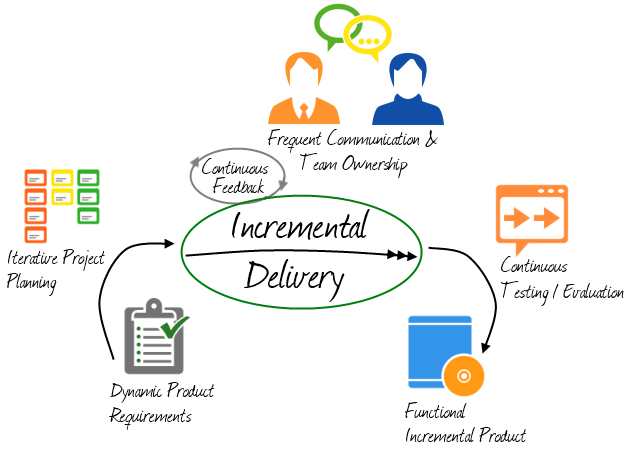 Its main feature is that it is a simple framework that helps teams to collaborate better on complex projects. The emphasis of this method is on collaboration, self-management and –organization, flexibility and adaption. Scrum employs the idea of empirical process control, i.e. it observes the real progress and not just a forecast to plan and schedule a project. Schedules are divided into short events, also called “sprints”, and after each one is finished the completed work is assessed and necessary changes to the project objectives can be made by the Scrum team. This helps control risks and optimize their predictability. The scrum method is popular with managers and developers because it is a framework with a simple set of rules, defining the roles and responsibilities of the Scrum team. It is very effective because instead of giving the teams specific tasks, they are given a set of objectives, so they can decide on and develop their own tactics of how to achieve the objectives most effectively. The constant progress assessment in short time intervals allows for quick reactions to necessary change and it also helps the team see what they have already accomplished in that time. How does scrum work for project management? The scrum method was developed for teams to deal with complex product development tasks and offers them a simple set of rules to deal with the complexity of the process: the three Scrum roles and the Scrum events (sprints). Product owners know exactly what the requirements and necessary steps of the development process are (product backlog), they decide what needs to be done and provide the development team with the objectives. They are also responsible for maximizing the value of the product and the value of the work of the team. The product owner has exclusive decision making competence, which means that changes have to be approved by them. Scrum masters do not take the role of ‘project managers’, because in Scrum the idea of self-management is important. What they do is to ensure that the whole process goes smoothly and helps to optimize and improve it and the team’s productivity. To do so their role is to eliminate any obstacles that might endanger the reaching of the specific sprint goals and the overall objective. A team has ideally between 3 and 9 members with cross-functional skills. This guideline is important because less than 3 members means that there might not be enough interaction and the members might not have all the necessary skills to complete the sprint. Too many members would need too much coordination which would increase the complexity of the process. The task of the development team is to build the product and through self-management it is responsible for organizing and completing the work and meeting the goals of the sprints in the given time frame. Agile Project Management with InLoox PM • Copyright 1999-2019 © InLoox, Inc. All rights reserved.